The heat pipe is a device having a high thermal conductance which utilizes the transport of a vapour and rejection of latent heat to achieve efficient thermal energy transport. The theory of heat pipes is well developed. Their use in applications involving temperatures in the cryogenic regime, and with development units running as high as 2000 degrees C, shows that they can function over a large part of the temperature spectrum. Applications in spacecraft, electronics and die casting are but few of the uses for these devices. A heat pipe is a device that efficiently transports thermal energy from its one point to the other. It utilizes the latent heat of the vaporized workingfluid instead of the sensible heat. As a result, the effective thermal conductivity may be several orders of magnitudes higher than that of thegood solid conductors. A heat pipe consists of a sealed container, a wick structure, a small amount of working fluid that is just sufficient to saturate the wick and it is in equilibrium with its own vapor. The operating pressure inside the heat pipe is the vapor pressure of its working fluid. The length of the heat pipe can be divided into three parts viz. evaporator section, adiabatic section and condenser section. 3. The wick or capillary structure. A first consideration in the identification of a suitable working fluid is the operating vapour temperature range. Within the approximate temperature band, several possible working fluids may exist, and a variety of characteristics must be examined in order to determine the most acceptable of these fluids for the application considered. The selection of the working fluid must also be based on thermodynamic considerations which are concerned with the various limitations to heat flow occurring within the heat pipe like, viscous, sonic, capillary,entrainment and nucleate boiling levels. It is a porous structure made of materials like steel, alumunium, nickel or copper in various ranges of pore sizes. They are fabricated using metal foams, and more particularly felts, the latter being more frequently used. By varying the pressure on the felt during assembly, various pore sizes can be produced. By incorporating removable metal mandrels, an arterial structure can also be molded in the felt. Fibrous materials, like ceramics, have also been used widely. They generally have smaller pores. The main disadvantage of ceramic fibres is that, they have little stiffness and usually require a continuos support by a metal mesh. Thus while the fibre itself may be chemically compatible with the working fluids, the supporting materials may cause problems.More recently, interest has turned to carbon fibres as a wick material. Carbon fibre filaments have many fine longitudinal grooves on their surface, have high capillary pressures and are chemically stable. A number of heat pipes that have been successfully constructed using carbon fibre wicks seem to show a greater heat transport capability. The prime purpose of the wick is to generate capillary pressure to transport the working fluid from the condenser to the evaporator. It must also be able to distribute the liquid around the evaporator section to any area where heat is likely to be received by the heat pipe. Often these two functions require wicks of different forms. 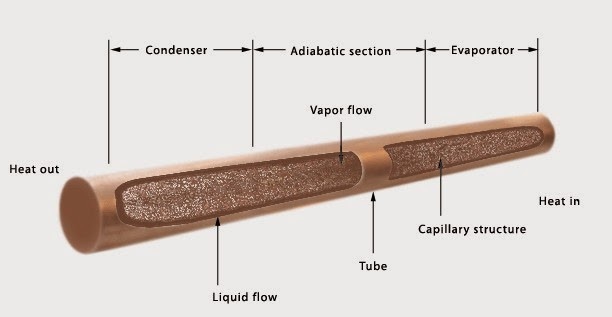 The selection of the wick for a heat pipe depends on many factors, several of which are closely linked to the properties of the working fluid. hot region to a colder region. It requires no addition of external energy. shuttle leading edge during reentry. exchangers as air heaters on boilers. medicine and human body temperature control, engines and automotive industry. must be above the evaporator in a gravity field. component and armatures for electric motors. transistor packages assembled in arrays on the top of the heat pipe. returns to the evaporator. Used in electronics cooling. continuing and the heat pipe no longer functions properly. heat pipe causes the liquid in the wick to boil and evaporate causing dryout. in the wick are torn from the wick and sent into the vapor. Results in dryout. during startup of heat pipe. overcome viscous forces. The vapor from the evaporator doesn’t move to the condenser and the thermodynamic cycle doesn’t occur. XY Mega Flats: Surface maintained within .01° F isothermal with concentrated load centers. 6″ X 6″ Mega Flat: Dissipated 850 watts from a printed circuit board. Lightweight – ½ the weight of aluminum. Very light weight – 1/3 the weight of aluminum.